Hi i would like to understand who is destinatary of the checkbox in attachment. I only know about Emetteur/Responsable, but who is Equipe projet, chef de projet and so on ? Is it possible to send notification to a list of profile ? 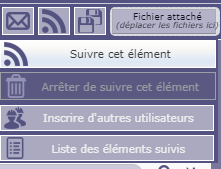 Okay, thank, but what do you mean by "Utilisateur au suivi" ? Who is it ? And moreover, is it possible to define several users for notification (separated by comma for example) ?